This limited edition Stretch folder features a Damascus blade and black Nishjin glass fiber handles. This sprint run is limited to just 600 knives. The Spyderco C90 Stretch started as a pet-project lockback knife design. Spyderco’s owner and chief designer made it for his personal use, incorporating features he wanted. He wanted high performance blade steel with edge retention super-powers for outdoor cutting: things like wood, rope and anything encountered in the wild. It had to work equally well indoors on cardboard, mail and fingernails. He sized it so it wouldn’t scare non–knife people and made it look slick on the off chance he’d someday have to wear a suit. 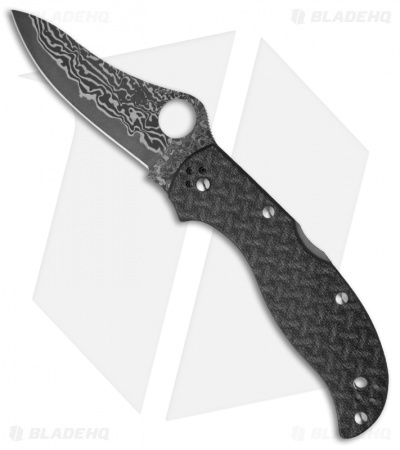 The C90PBK exemplifies all that is Spyderco, function, high performance, advanced materials and workmanship in an out-of-the-ordinary package.